The last time I dug into the English Premier League (Week 6) the League Table had Chelsea 1st (16 points), Southampton (13 points), followed by Man City (11 points), then Aston Villa, Swansea City, and Arsenal all tied for fifth on (10 points). 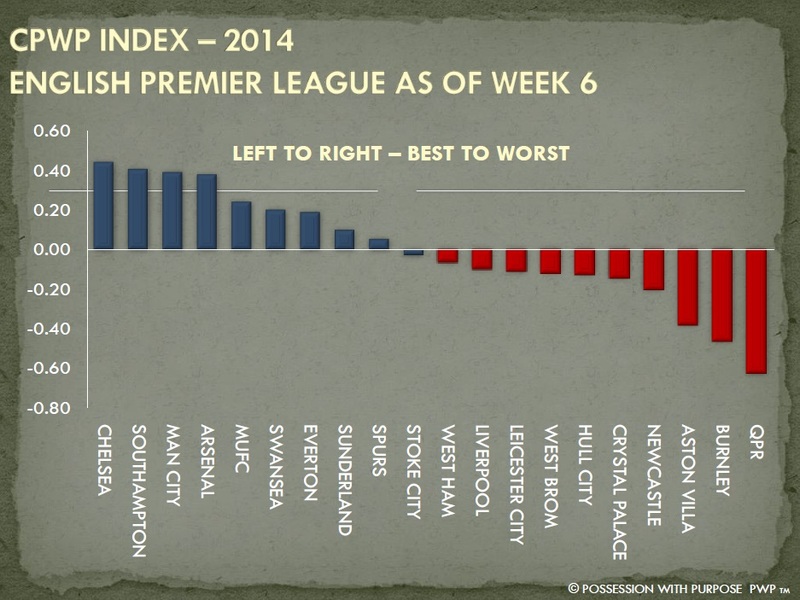 Five of the six teams in league table were part of the top seven teams in the CPWP Index; note how far down the Index Aston Villa was; even on 10 points and tied for 5th place! Was that an indicator that their early season run was more about luck than strong team attacking and defending across the entire pitch? I’m not sure – but I’ll take a peak at both West Ham and Aston Villa, in a few, to give you a picture on how those teams performed in the first 6 weeks versus the last 5 weeks. For now, fast forward to the end of Week 11 and here’s the lay of the land in the League Table: Chelsea sit on 29 points; Southampton 25 points; Man City 21 points; West Ham 18 points; and Swansea City 18 points. Moving up from 7 points after week 6 (tied for 13th) to 18 points was West Ham. While Aston Villa took a complete nose dive (sorry Tom Hanks) to 16th with 11 points. 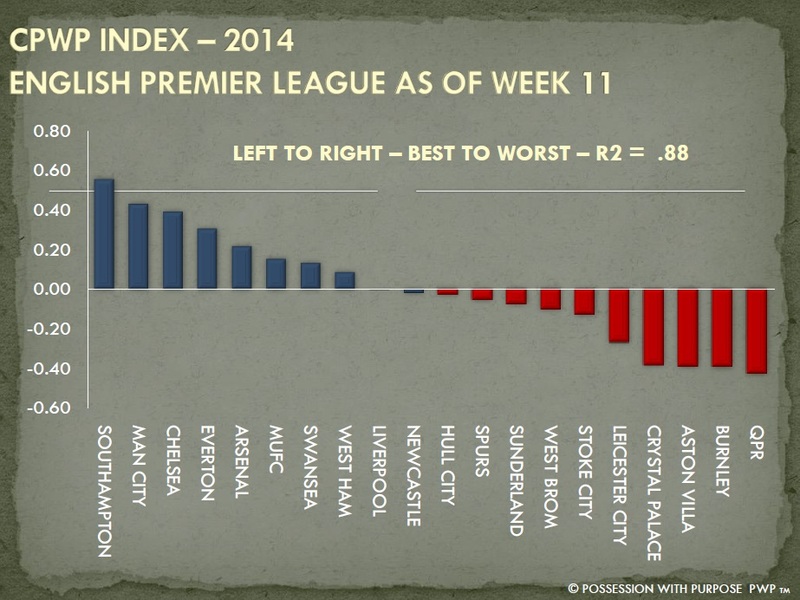 In looking at the Index West Ham is 8th best, compared to 11th best five weeks ago. Southampton and Man City have both shifted past Chelsea (probably related to defending and not attacking) while Swansea has dropped below Man United, Arsenal, and Everton. I’ll save that for later – just like the mystery about Southampton. In regards to Aston Villa, they’ve not moved an inch in the Index – suppose one wouldn’t expect it seeing as they’ve only taken one point and it’s hard to drop lower than Burnley or QPR. Nevertheless – be prepared – there is some grist coming up that may surprise you. Clearly the amount of possession has increased (considerably) during these two phases – a 9% jump is considerable in my opinion. Whether that is a result of the opponent or an internal tactical move is hard to determine at this stage but it should be noted there was a bump (increase) across the board in all the key PWP indicators with one exception – goals scored divided by shots on goal. In looking at Major League Soccer for two years now the explanation usually goes along the lines of this. 1) The opponents decide to cede possession somewhat by playing deeper against the attacking side… both Portland Timbers and Philadelphia Union did that this year and both organizations substantiated (in one shape or another) that tactic. To reinforce that position – their average total Attacking Final Third passes, per game, in games 1-6 were ~89; that number vaulted to 120, per game, between games 7-11. 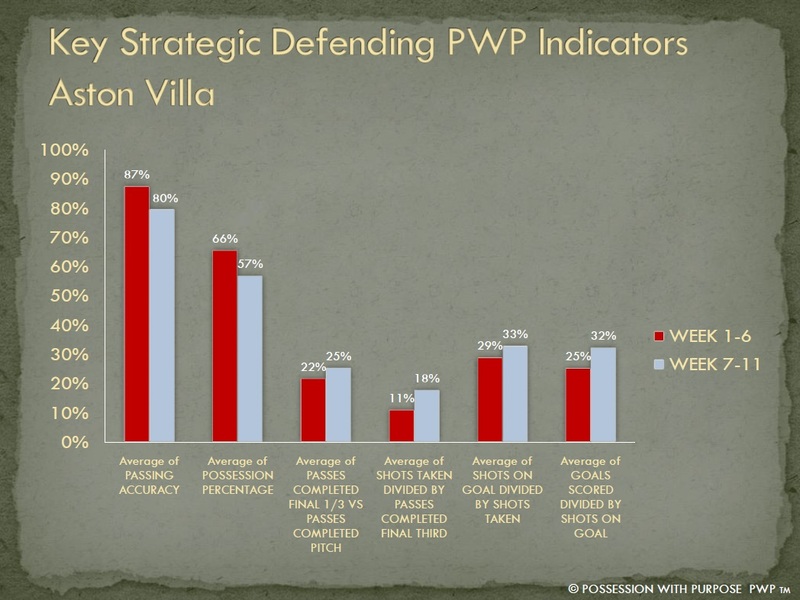 Clearly the opponent looks to have taken a different approach in defending against Aston Villa – OR – Aston Villa has tried to step up penetration based upon overall possession; if Villa has attempted the later of the two I’d suggest they revisit their tactical attacking approach. 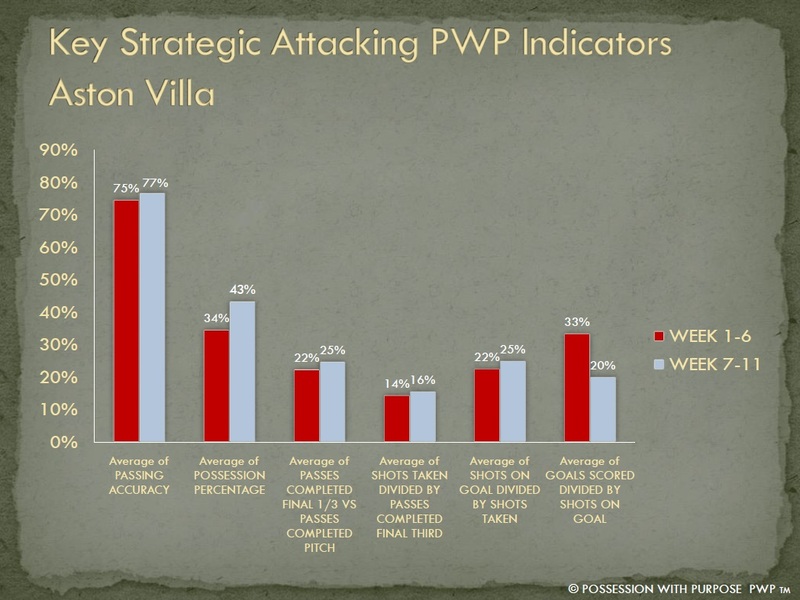 2) The trend for teams who don’t pass as accurately as the other teams in the league (Villa are in the lower half) seems to be that more possession sometimes includes more penetration and more shots taken, but that volume and percentage increase does not translate to goals given a somewhat higher potential for impatience. When checking out West Ham there can be an economy of scale – but I think it’s probably more to do with the type and skill of the current players available as opposed to the normal course of events. The change between both phases, in defending, almost seems to match the attacking pattern of West Ham, with two exceptions. Overall opponent possession did drop, as did passing accuracy, but penetration increased, as did shots taken per penetration, shots on goal per shots taken and goals scored per shots on goal. Pretty much indicating to me that the opponents worked hard to trap Aston Villa going forward, ceding possession in order to gain critical time and space in quick, purposeful counterattacks! That may sound a bit early as an observation – but these same trends have shown themselves in the MLS for the last two years – and after awhile it does appear that generic patterns are showing through. In this diagram there’s almost a direct contrast; where Aston Villa’s numbers pretty much increased across the board, with the exception of Goals Scored – it’s almost the opposite for West Ham. For West Ham their passing accuracy decreased, possession remained the same, while penetration, and shots on goals versus shots taken decreased. Only two increases, the percentage of shots taken per penetrating possession and goals scored. When studying teams in MLS this year – a pattern like this seemed to indicate a team leaning towards a more direct attack in nature. The primary indicator supporting that, given lower passing accuracy and lower shooting accuracy, is the percentage and volume increase in shots taken per penetration. For some teams that percentage works better when lower – especially when they have a higher passing accuracy. 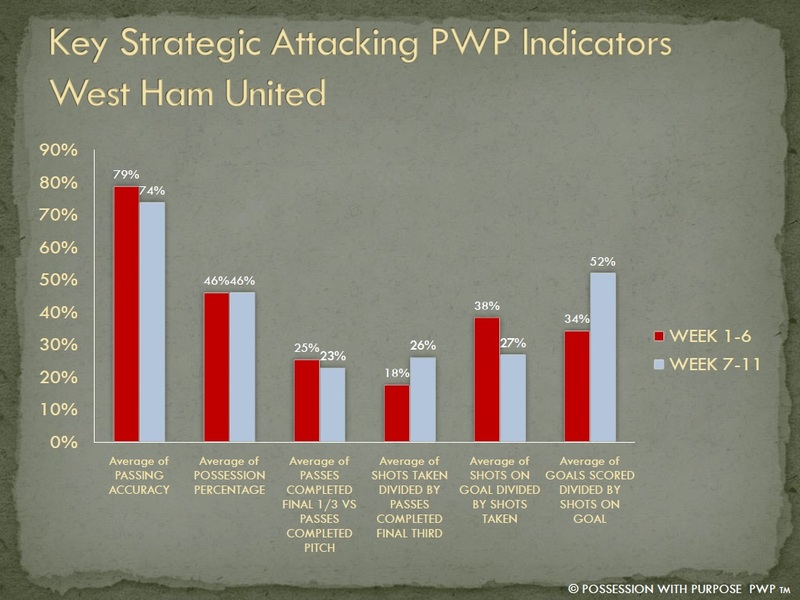 But in the case of West Ham, it is likely they are simply looking to take more shots, quicker, and with less penetration. Working off the philosophy that more is better. In La Liga we know that more was better, the same held true for the World Cup as well – so this approach may be Sam Allardyce’s way of getting more with less. When looking at the two separate phases, West Ham averaged 15.20 shots taken per game in games 7-11 versus 13.33 in games 1-6. In addition, in games 7-11 they averaged 106.4 passes within and into the final third, versus 121.5 in games 1-6. The other interesting note is that as passing accuracy decreased so did the volume – again speaking to perhaps? harder/longer balls being played in order to move the ball quicker into the final third when the opportunity presented itself; below are the average volumes during these two phases to confirm that. West Ham total passes attempted (411.80 = 7-11) and passes completed (262.80 = 7-11). As seen between phases I and II the volume of passes attempted AND passes completed decreased. In looking at the end results – the percentage of goals scored per shots on goal went up by 18%; that huge increase in percentage only equates to an overall increase in goals scored, per game, of 1.67 to 1.80. What appears to me is the same thing type of pattern that I’ve seen with Portland Timbers and Philadelphia Union this year. The defending tactics seem to indicate the opponent has been ceded time and space outside, and moving into, the defending final third a bit more. In turn the percentages of penetrating possession and shots taken increase – but with reduced time and space (given a tighter/deeper line) the shots on goal and goals scored percentages have dropped. When looking at the volume of opponent passes across the entire pitch, it was 446 total passes in the first phase with 363 completed; versus 411, with 262 completed, in the second phase. Again, it appears the data supports West Ham ceding time and space a bit higher, or, the opponent attacking habits were different compared to the opponents faced in the first phase? When looking at the volume of opponent passes within the defending final third, the average was 120 passes attempted and 78 completed in the first phase and 126 passes attempted, with 80 completed, in the second phase. Not that much of a difference – but in saying that the goals against in phase I was 1.67 per game, while in phase II it was .80 goals against. All things considered, I’d offer that Allardyce has changed some tactical styles during the first 11 games. Whether I’ve nailed the time period probably doesn’t matter – the more important thing for West Ham is that they’ve done something of value to increase goals scored and decrease goals against. In the analyses I’ve done these past two years it would appear to me that the back four is playing a slightly deeper line and with that the attacking tactics are now sharper, and perhaps quicker. All that going on with a draw to Stoke City and a win at home against Man City. What may be troubling to the West Hammers is that their other games, in this five game stretch, included matches against Burnley and QPR; teams they should beat if a ‘should win’ is a reality in the English Premier League! As for Aston Villa; their last five have included Man City, Everton, and Spurs, as well as QPR – a team (perhaps?) they shoulda beat??? and the draw with West Ham. 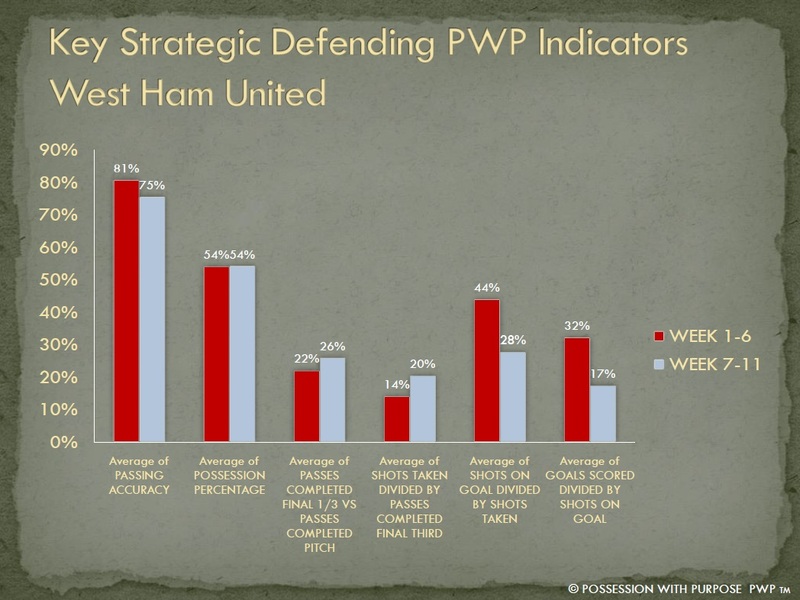 For all intents and purposes, it does appear that the PWP Key Strategic Indicators have pointed out some items of interest that may point to teams taking different tactical approaches. The patterns seem to hold based upon what has been seen in MLS. I wonder if those same patterns will begin to take shape in La Liga and the Bundesliga? If so, kind of makes you consider that soccer, on both sides of the pond, is not that different at all – (perhaps???) it’s just what money gets spent to purchase top quality players and top quality managers???…. I.e. – if you spend enough money, in any league, it looks as if the tendencies of teams that don’t have higher quality players (spend the same amount of money) is to cede possession and play counter/more direct. COPYRIGHT, All Rights Reserved. PWP – Trademark.